La Papoñita's delights pleased 94% of the participants last Sunday. That seems like a significant majority, so we will be going back there this week. Come by 18 de Julio (the main drag in Montevideo) at the corner of Minas and right next to the park at 14:00 (2 pm), and see for yourself. 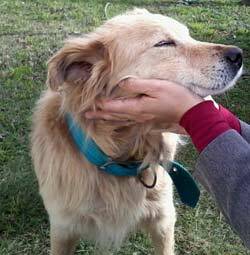 In addition, one of the sites, the Mary Brown Animal Help Uruguay has rescued dogs and cats available for adoption, such as the golden retriever rescued on Tuesday. 2. 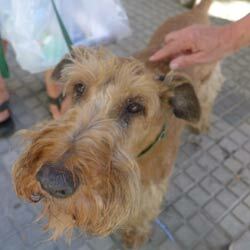 Jax is still missing: Pat and Jess's Irish terrier hasn't been seen for over a week now, and they are really sad. Photo attached. He was last seen near Atlantida. If anyone has seen him, or can help with the searching, do so. If you find him, please call Jerry at 091 323 711. 3. The Thursday Poker Game: 6 pm at the Viapark Hotel in Parque del Plata, which is east of Montevideo along the coast, right beyond Atlantida. Kitchen is open at the start of the gathering. Not a poker player? No problem, come and socialize! If you are interested, for now or for the furute, or would like more info, please contact sam.oneil the "at" sign gmail.com. 4. The Friday Night Montevideo Language Exchange at the Costa Azul, organized by David Hammond (and before that, by Doug Heller) formerly every other Friday, is now being hosted by Kathleen Archer, a local Uruguayan. At her suggestion, it will take place EVERY FRIDAY, so there will be no more confusion about when it is taking place. If it is a Friday, people will be getting together at the Costa Azul, which is located in Pocitos at Tomàs Diago 843 at the corner of Scoserìa. 5. There is a flute for sale, a Gemeinhardt, which originally cost US $ 925. The minimum bid is US $ 400. Please respond to durandetto the "at" sign aol.com. 6. Music: The opera Hänsel & Gretel by Humperdinck will be on the program at the Sodre in July between the 10th and the 16th, each time at 15:00. The reason for the early times is that it is a children's opera, with many melodies you probably already know, so it is a fine event to introduce children and adults, too, to opera. If you are not an opera lover, you might want to give this a try, since you know the story, and the prices make it painless. Ticket prices start at $120 (pesos), and we always get the cheapest seats, having find they are completely acceptable. Let me know if you are interested, and which date would be the best for you. The rest of the items will have to wait for next week.